We’ve all been tempted by that “Vitamin Special” stocked conveniently on the end of the aisle at our local grocery. An opportunity to do something good for your body while saving the bank? Sounds like a steal! Whether’s it’s a low-cost multivitamin or an easy to find herbal sleep remedy, supplement “steals” are rarely deals. Aside from the occasional sale on a quality product, most low-cost vitamins, herbs and specialty nutrients lack adequate scrutiny and quality control in their production. The FDA requires companies to keep systems in place which verify safety and accuracy of ingredients, but many of these companies take shortcuts which go unseen. The result is products of varied strength, undisclosed fillers, out of date ingredients, and sometimes no trace of any ingredient listed on the label. This is what the New York State attorney general’s office found recently when they tested herbal supplements from GNC, Target, Walgreens and Walmart: many products contained zero DNA evidence of the advertised herb. Product quality and safety are top priority when supplementing your body, which is why Lake Oswego Health Center offers only professional-grade vitamins, herbs and specialty nutrients. Our reputable suppliers employ rigorous quality assurance programs for testing and tracking of raw ingredients, manufacturing processes and finished products. We are proud to carry products tested and approved by companies such as Emerson Ecologics, LLC and Natural Partners, Inc. Even when labels are correct and quality control protocols are followed, you may end up buying a “health” product filled with synthetic food dyes and fake sweeteners. Why do companies use these? Color and taste-appeal sell, period. Don’t spend your money on unhealthy ingredients. Scan your products’ ingredient labels and beware the additives listed below. Dyes—Many dyes still used in the USA are banned in countries around the world. Protect your health by avoiding unnecessary colors such as Blue #1 and #2, Yellow #5 and #6 and Red #40. Sugar and Artificial Sweeteners: Pure table sugar and synthetic sweeteners are often hidden in tablets, capsules, powders and liquids. Check labels carefully and avoid products that are laced with sweeteners such as sucrose (table sugar), sucralose (Splenda), and aspartame (Equal). 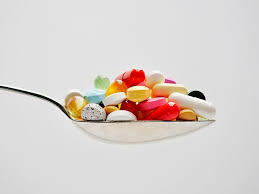 Don’t let misleading supplement “steals” get in the way of your health and healing. Please use only professional-grade nutraceuticals ordered by your healthcare practitioner through ethically responsible suppliers. Have a question about your current supplements? Schedule a visit with your doctor at Lake Oswego Health Center. We will help you weed out unhealthy “health” products, and condense your supplement regimen to actually save more money.